Writing is in large part dealing with discouragement. And uncertainty. The two things that we must face are discouragement and uncertainty. And poverty. The three things – hang on, I’ll come in again. So: discouragement. For just about the first time I came away from a meeting wondering what the point of it all was: why am I struggling to produce something that’s just not working? If I can’t create tension in quiet scenes then I’ve got nothing worthwhile at all. Quiet, building scenes are the most common in my novels and it’s a skill that needs to be mastered. But my heart, my instincts are telling me that these scenes will work. When they’re placed in context, when we’ve had the full build-up of the novel to develop the characters and their voices, then this will come alive. I have to believe that. Sure, the writing needs improvement. I can sharpen the dialogue and the action and bring the characterisation alive. This is a first draft. Of course it’s not going to be perfect. I’ve written before (at least once) about the unimportance of words in this context, and I still believe that I’m right. So I am upon the horns of a dilemma. I can’t allow myself to ignore criticism as that way lies arrogance and a failure to grow as a writer. But, frankly, I think that my group is wrong. My novel will work. This will work. As a writer you need to be able to accept criticism and rejection and sometimes you’re going to hear things that hurt and sometimes you’re going to be left thinking ‘this person just doesn’t get it.’ But if you’re hearing the same thing over and over – the same specific suggestions, the same problems highlighted – then you really do need to look hard at your work and your skills. But you need at the same time to have a little faith in yourself. As for me, I’m going to ignore this discouragement for now and crack on. There’s plenty of time for agonising in the second draft. But in order to have a second draft you must complete the first. And that’s what I’m off to work on now. Okay, here’s how it works: if you’ve just released a book – self-pubbed or trad – and you’re wondering how to promote it then you’ve already got it wrong. Sorry if that’s a harsh message, but it’s true. In order to successfully promote your work then you have to have been building a presence on the internet (because what else matters?) for months – if not years – prior to your first release. It’s a rare thing that anyone will buy a book simply on the basis of its cover or its glowing Amazon reviews or on the endorsement of people they’ve never heard of. Studies (that I can’t quote, sorry) show that you have to have heard an author’s name (or a band, or an artist) at least five times before you’ll consider buying one of their works. I’m proof of this. I’m on Twitter. Some names I come across with regularity. Those people – whose comments I appreciate and enjoy – are the ones I’m going to take a punt on. The one-note shouters will never see my money, thank you very much. Selling books is not an overnight thing. You are fighting the long war, deep in the longue duree. That’s why I’m writing this blog. That’s why I’m on Twitter and LinkedIn. I have no product to sell – yet. One day I will have. And I’ll have a body of work – more than that, I’ll have a personality. I’m (hopefully) not just another barker shouting on the street corner. I’m a human being and people are much more impressed with humans than they are replicants. With that in mind, here’s my incomplete list of methods of promoting your book and a few thoughts thrown in, just for good measure. This section was originally called Networking, but people get the wrong idea about this. They think that it’s all about schmoozing in trendy Soho winebars (or, if you’re American, insert a poncy area of New York), or trying to catch an eye at a party, of pushing yourself beyond human decency for the sake of a small advantage. Hell, you’re probably thinking of the casting couch or something, aren’t you? It’s not. It’s none of these. It’s about looking around you at your friends and asking yourself who they know. Or what they do. It’s about asking favours. It’s about being polite and respectful and not pushing – but asking nonetheless. Just take a moment to think about your friends and acquaintances. Where do your colleagues work? Might they be willing to ask a favour on your behalf? Are they easily bribed with wine or chocolate (because a favour deserves a thank you)? By this stage in your career you should be in a writing group; there, already, are a lot of people who might have thoughts or ideas or contacts. Ask them. I wager they’ll be willing to help. The only price, save the aforementioned wine, is that you’ll be expected to return the favour. Example: in my writing group there is a local writing festival organiser. There are a few who work for major (non-fiction) publishers. There was a professional copy-editor. At least one is agented: several past members are fully published. This is only a small selection – and here I’m only looking at professional activities. I’ve not even touched on their friends. There is a reason why Six Degrees of Separation is a game/concept. You know people who know people who know people. You don’t have to push, you don’t have to dig, you don’t have to be some arrogant Hollywood big-shot to network. Just be polite. Be nice to people. Help others. And they’ll be a lot more willing to help you in return. A few notes: I don’t know about you, but the idea of most of these fill me with horror. The best way to overcome your fear is to combine your efforts with those of other local authors. If you’re not in a writing group then you’re missing out. The mutual support is invaluable. Secondly, make sure you invite everyone. Not just your friends, but contact the local press, any book-bloggers you might be following on Twitter (not for school visits: they’re a bit fussy, these days, about who walks in to chat with the kids) – hell, take punts and invite celebrities. Remember what I said about having to have heard a name five times before it settles in the brain? Most people you invite won’t come. But really – what have you got to lose? Email is free. Just be polite and unpushy. Invite literary agents because you never know who might be in town. Note, though, that if you’re theming the event – for example if all the authors appearing specialise in science-fiction – then you’ll lose credibility if you send a group email to every single entry in the Writers’ and Artists’ Yearbook. Actually, never send group emails. To anyone. There aren’t enough journalists these days. Those that still exist are overworked and underpaid and are desperate for copy to fall on their desk that they can shove in the papers without any input from them. So whatever you do make sure you write a press-release and send it out to the local rag. And when I say ‘local rag’ I mean any rag that you’ve ever been local to. For example: I was born in Bradford, moved to Norfolk, went to university in Belfast and now live in Oxfordshire. So that’s four places to which I am local, every one of which has multiple papers to target. If they get back to you and invite you for an interview (don’t laugh; it’s happened to people I know) then for heaven’s sake take them up on the offer! Before your book is released you should be contacting all the book-bloggers you’re following on Twitter (you are doing this, right?) and asking if they’re willing to review your book. Many won’t: the biggest will be choked with people like you. But you can only lose if you’re rude or abusive. And some will take it – and if you do a get a review, be grateful – even if they say you’re a horrible writer whose entire back catalogue should be ritually purged and all mention of your existence be expunged from history. It’s always worth getting some bookmarks (which double as business cards, with your internet presence highlighted – probably not email address: Twitter, Facebook and your website/blog addresses will be fine) to give out at any events you do host or take part in. Bear in mind that many people aren’t prepared to spend money on the spot. Most people like to go away and reflect before committing to a purchase. Make it easy for them. Chances are that if they have to hunt to find you they’ll just give up. Don’t let that happen. I’ve left this until last because it’s the single most important thing you can have. It also ties together everything I’ve mentioned above. It doesn’t have to be anything like this: it doesn’t have to consist of regular musings on your life and of your irritations with the way the world is persistently ignoring you. What you need is a portal from which people can see everything I’ve outlined above. It’s a place for people to springboard onto your Twitter feed, your Facebook group. It should outline your work and provide links for people who want to buy it. You can copy (or link to) any mentions you get in the press. Any events you’re involved with should be mentioned (and, if it’s an open event, this is where you place the invite). Publishers and literary agents do look at these things. A good website might not sell you a deal but a bad one – or an absent one – might lose you one. If you’ve not got one of these, do it. Do it now. Finally, just remember what I said about the longue duree. This isn’t a sprint. These things don’t happen overnight. No one single thing is going to make you the next Hugh Howey or – god help you – EL James. It takes sustained effort, time and patience to make a career as a writer. But it is doable. Relax. Take your time. Enjoy the process. Remember: nice guys finish first. It’s quantum. That’s what it is. Everything is uncertainty: the drawing of pieces into their necessary positions without knowing quite what the necessary positions are. Everything I’ve written in Oneiromancer is there because it hopefully leads the reader to a place that’s a logical consequence of the set-up. Now my characters are facing their final obstacle, their grand climax. Unfortunately it’s all become a little… quantum. According to Heisenburg, you can never know where a subatomic particle is until you look for it. The act of observance collapses all the probability-waves and makes an option resolve itself. Behind is the story I’ve observed so far. Ahead is a great fog with just rough shapes and behaviours, the whole phase-space of ideas. I need to weave all these possibilities into Story. But sub-atomic wrangling isn’t the easiest task. I need to tease all my characters into position at the right time. My real problem is that I’ve not the clearest idea of where I want people to go, or why there’s pressure for them all to be together at the same time. I thought I had it: I wouldn’t have been able to start writing without some idea of where I was going. But now I’m at the gates and it’s not resolving as it should. So I try pieces out: I write scenes that I think bring me closer, have the right ‘shape’. But by writing these scenes, by setting them down, they are being observed. Once they’re in place they become solid – and so the next scene has to be set around that and so the chain reaction builds. It’s quantum. Of course it’s not permanent or immutable – the Large Hadron Collider that is the second draft will soon be brought in to smash errant words or paragraphs back into the primordial letter-soup. And even these ‘ghost scenes’ pull on the mind. It takes a lot more than the LHC to erase the memories of scenes deleted. That is, generally, a good thing: the author is left with a deeper understanding of what his characters are going through, even if that barely reaches the reader’s consciousness. Unless the scene is overwritten, in which case none of this ever happened and a new leg is inserted into the trousers of time. It’s my own damn fault. Narrative causality + internal logic = pain in the arse. I need to write this thing. But I can’t because the pieces aren’t in the right places. That’s what this first draft is. It’s making mistakes, it’s going up blind alleys, it’s rewriting the past with what you need to be true now and then going backwards in time to foreshadow all that made today possible. It’s also time for A Map. If ever in doubt about where you need people to be, if you’re not seeing what you need to see, a map is usually a help – to me, at least. 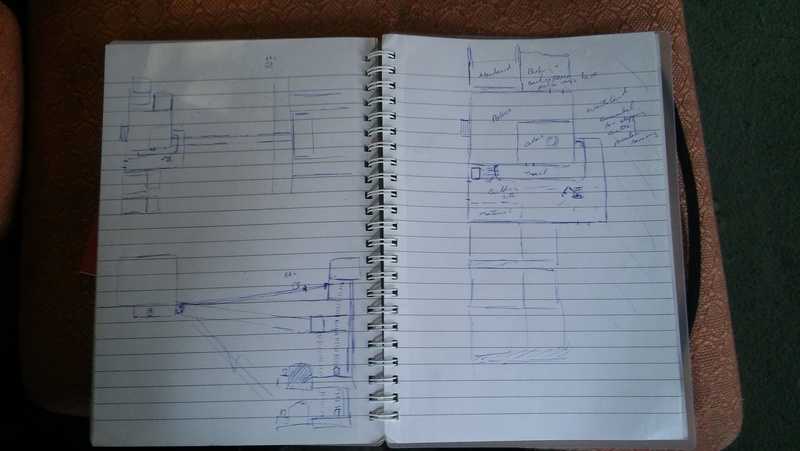 Just a sketch of the physical environment that details the space the scene will operate within. Then – then I’ll be able give my action gravity and form and continuity. And then, because I’m a wizard, I’ll send my characters back in time to make the past fit in with the present I desire. Because that’s how you write. Base over apex, arse over tip, action and reaction swapped. Which is wonderful. But if there are no limits, if the ending shapes the beginning and not the other way round, how the hell do you limit your imagination? What tells you what’s ‘right’ and what’s ‘wrong’? I’ll get back to you when I have an answer. My final argument for not overdoing the planning is this: writing is more fun when you’ve still got things to learn. Every novel I’ve written has begun not when I know every twist and turn but when I’ve got the shape – both of the plot and of the characters. But characters change and grow and mutate, and that’s when the act of creation is truly thrilling and almost visceral. I began Oneiromancer when two new characters sprang almost fully-formed into my vision, immediately dominating the cast that I’d been building for years. After writing with them for a few weeks I realised there’s still space to fill in my cast-list. My original idea was to have one of the estate’s ‘bad kids’ as a point-of-view character, and maybe to have a female PCSO as the old ‘innocent in the enemy’s camp’ meme. Somehow they spun together and Jazz Kinney is now one of the most important characters in the novel. Similarly, a cop that I’d set up as one of the story’s villains has somehow grown sympathetic and curious and embittered. Cartwright is now set to be one of the main characters – along with Jazz – and almost overshadow the blokes around whom the story was originally wound. This is beautiful, and glorious, and even if this novel never comes close to publication and remains only as an abandoned draft on an abandoned hard-drive – well, it’s given me hours of joy to see these people take me in directions I never thought I’d go. You read of the character’s ‘journey’, their story-arc through which they must grow and develop and change – well I’m living that right now as the author. Which is not to say that I should be happy with the changes, the things they’re telling me to do. I’m having fun but I’m not just doing this for my own jollies. I want it to work as a story. I want other people to read this and share with me these characters. So this can only be the start. I’ve got to nail their dialogue. I’ve got to make these people convincing and realistic. And that means going back to the beginning, when I only had the faintest inkling of what Jazz and Cartwright – and the others, the minor characters who’ve pulled themselves into a constant orbit – and use my later knowledge to inform their earlier appearances. At the moment I’m still getting to know my cast. They’re still revealing to me their real fears and dreams and the horrors that lie deep, deep within the skin. It might seem like a paradox to say that you have to finish a novel to know how it should begin, and that you can’t end a novel without starting. But it’s not. It’s what editing is all about. This first pass is all about getting to know them. Getting the story down and finding out who really lives within your character’s skins. It’s only when you’ve done this that you can go back and see all the things that your cast would never do in a million years – the boyfriend they’d never actually have, the unrealness of that particular action. The first draft is the hardest. All those times you felt yourself beating against the floodgates and struggling to walk against the torrent, just treading water and desperately screaming for a life-raft. But it’s also the most invigorating, the most awesome adventure. The moments where you find you’ve been holding the map upside down, when everything clicks into place. It’s a feeling like no other. Like falling in love every day. And it’s all about the people – the weak, fallible humanoids you’ve thrust into the fire again and again and again. They’re the ones who really make your story sing. I forgot a character for 100 pages. How do you do that? Just completely forget his existence whilst at the same time building for his denouement? Takes a special kind of dysfunction to hold contradictions like that. Fortunately I’m a writer. I’m in a permanent state of dysfunction, capable of believing six impossible things before breakfast. So, the work-in-progress then. I’ve talked before about how the first draft is essentially a walk-through; a dry run, showing what scenes you need, who’s where and when and how to get from one world to another. For that reason I’ve spent little effort in description or in making the world itself come alive. I’ve been concentrating on where people are at and where they’re going. I’ve also written a fair bit that will likely be completely cut. It’s one of the perils of this kind of procedure: unless you plan every scene in detail before first setting metaphorical pen to paper you’re likely to write in redundancy and waffle. Similarly, you’ll likely find yourself omitting scenes that, in later drafts, you’ll wonder how you ever did without. That’s the nature of the game. It’s the nature of my game. And I’m sure you’re there wondering if I’m going to turn round and advocate a more logical, planned approach. Nah. I’m still in the process of discovery: I’m telling myself stories, I’m learning and I’m happy. Even though it can be an absolute pain. Yesterday I hit the 100,000 word mark, which in itself doesn’t mean much. I’ve always envisioned this novel would weigh in at about 120k: more important is that I’m building up to the final climax, the last battle. I’m at the stage where, having a solid idea of where I want to end up, I’m now in the process of manipulating my characters so they get to the right place at the right time. In this particular case I have to work out how to break into a London police station that’s already on high alert. Logic moves slowly. Characters are rightly suspicious of manna from heaven; the buggers see traps in everything. To get from one place to another without a massive wrench is a case of a thousand tiny corrections, of a series of decision that all make perfect sense in themselves but inexorably lead my cast to where I want them to be. Hence these scenes that may well end up being cut. I have to write them. I have to know how this line of reasoning works – or if it simply doesn’t. Even if it all seems like a pointless slog, it’s much easier to write something and later cut it out than to have to go back and insert whole sections. Besides, you never know – and you always hope – that although you’re going through the motions your readers might love the quiet, tension-building scenes as much as the noise. You might just have written something really good, and this is just standard first-draft doubt. Incidentally, whilst I was lying in bed the other night I suddenly realised that I might want to take out a whole loop of action: around 20,000 words would be erased with just a snap of the fingers. That’s still an option. Every story is about the roads walked: but sometimes the roads you’ve not gone down are the ones that fascinate the most. The road not travelled. And there’s no time better to see those than when you’re first-drafting. So where goest I now? Well, I go the only way I know and that’s onwards. One foot in front of the other, marching, hobbling, ambling down that road. This isn’t the time to look back, to wonder if there wasn’t a shortcut better taken. It’ll have to be examined later, when I can properly sit back with a map and review all the junctions and signposts and ghost-towns I passed on the way. There are always other options. All those brilliant stories you fell in love with throughout your life? In another world they’d all end differently. Some would be better for it. Some, of course, would just be a whole lot weirder.